The picture is exhibits how Arduino pins belong to AVR ports. If you look at my code it sure looks strange. This is due to the aggressive optimizations. So let me dissect them one by one. The simplest optimization is the use of the goto statement. Although the loop function will be repeated forever there is some slight overhead attached to it. This overhead consists of 3 things: entering the function, leaving the function and processing a tiny bit of code outside of the function that is not relevant for counting at all. The goto statement will get rid of this overhead. Compared to the other optimizations it is the simplest but also the least effective. The next optimization is that I do not use digitalRead() and digitalWrite(). Instead I use direct port manipulation. If you already have some experience with direct port manipulation you will know that pin states can be read from the PINB, PINC and PIND while pin states will be set by writing to PORTB, PORTC and PORTD. However here I do something strange. I write to PINB, PINC and PIND. This is a not so well known functionality that is documented in the datasheet. Writing a bit mask into the PIN registers will toggle all pins that are set to 1 in this mask. So instead of writing the desired output bit mask into the PORT registers I write to the PIN register to indicate which bit I want to toggle. At first glance this does not seem to give any performance advantage. However there is a subtle detail here. 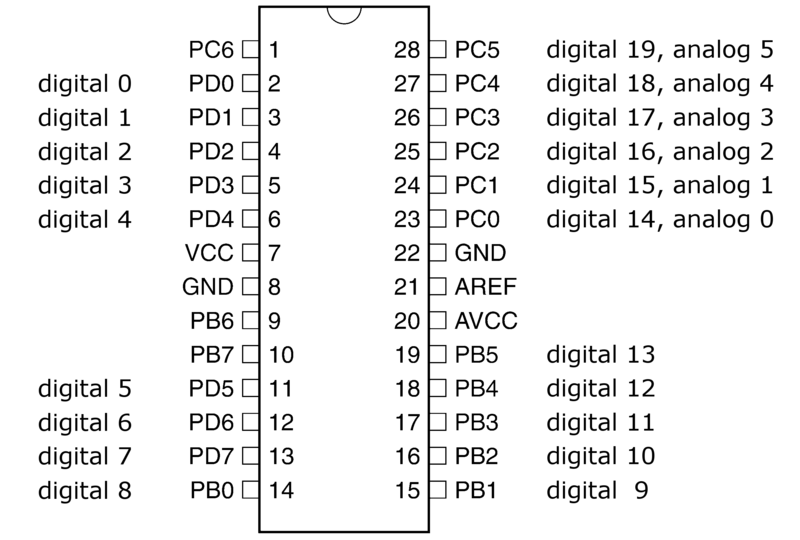 The Arduino processor has 32 general registers. That is the processor can hold easily 8 values in these registers. As I am toggling at most 8 different bits per port these 8 values will fit into the processor’s general registers. If I would be pushing the desired values directly into the PORT registers I would require 256 different values. Obviously 256 values will never fit into 32 registers no matter how hard you try. So if the compiler is clever the PIN register approach will allow to keep the values in the registers and thus avoid any value reloading in the general registers. As it turns out the GNU compiler is smart enough to apply this optimization. Thus the bit toggling approach is faster than pushing precomputed values into the ports. Now to the last and most aggressive of the optimizations – the COUNT macros. These macros are an “unrolled loop”. Instead of toggling the pins in some loop I have the macro processor output the toggle statements to the compiler. The macro processor will expand COUNT_1 to the following code containing 1 bit toggle operation. The next macro is COUNT_3. Since COUNT_3 contains the macro COUNT_1 the macro processor will expand this recursively and end up with 3 toggle operations. Similarily COUNT_7 gets expanded to 7 toggle operations. If you look up in the table above you see that these macros toggle the bits exactly as needed for counting in gray code. As you probably have already guessed COUNT_4095 gets expanded into 4095 bit toggle operations. But then there is something different. I do not introduce a COUNT_8191 macro. Instead I introduce a count_8191() function. Here is why. Have a look at the implementation of this function. It contains 8191 toggle operations. Each of these operations will take up at least one machine language statement. Since a machine language statement will take at least 1 word (=2 bytes) this function occupies at least 16382 bytes of flash memory. As an Arduino has only about 32 kBytes of flash memory I had to stop here because otherwise I would be running out of memory. So basically this function stops the exponential size growth of the expanded macros. Then the game continues. The difference is now that the expanded macros will contain function calls and toggle operations. For example COUNT_65535 gets expanded to the following code. That is 8 function calls and 7 toggle operations or a total of 15 C statements. Much less than the 65535 statements if count_8191 would be a macro. If you do a little bit of math you will figure out that COUNT_524288 will be expanded to a total of 256 C statements. As the final topping the successive application of the TWICE macro concatenates the COUNT_524288 macro 32 times. This is to reduce the overhead introduced by the goto statements as much as possible. Now how fast is this thing counting? My frequency counter says the lowest significant bit toggles at 3 956 121 Hz. This implies it toggles 7 912 242 times per second. Since the lowest significant bit toggles every second count this thing counts at 15 824 484 ticks per second. This is roughly 98.9% of the hardware clock. Not to bad for a software solution. If you want to verify this without a frequency counter there is a simple trick. My code is already prepared to divide the system clock by 256. You just need to remove one comment. This will effectively run the Arduino at 62.5 kHz. Thus the lowest bit will toggle at 15 454 Hz. Since each bit will toggle at half the speed of the previous bit, the highest significant bit will toggle at 1/2^18 times this frequency. This is 0.058 951 Hz or a period length of 16.963 seconds. This makes it feasible to verify the timing with a stop watch or a video camera. The video shows an Arduino running with this prescaler setup.